A Town of Art and History, this location is the place to go for journeys through history, water and music. We’ve made a date with the Medialonum Santonum for an experience that’s sure to be full of delights. Starting point: the arch of Germanicus, a vestige of the capital of the Roman province of Aquitaine. This imposing arch marked the starting (or end) point of Via Agrippa which linked Saintes to Lyon. Built on the right bank of the River Charente which flows through the town, it transports us to other eras and other surprises. Indeed, Rue de l’Arc de Triomphe, on which the arch sits, leads us straight to the Abbaye aux Dames. The Abbey – the first women’s monastery in Saintonge – unfolds before us, from the abbey church to the nuns’ cells, chapter house and bell tower. Equipped with Music Adventure headsets, we’re led on a journey through sound. In the Abbey’s courtyard, a contemporary musical carrousel sets the scene for collective musical creation. The story? Under an immense steel and glass dome sleeps Bazilik, a fantastic dragon creature made out of rattan, with a cockerel’s head and a snake’s tail. To wake him, visitors take their place at one of the 24 digital instruments embedded in his body and get swept away in a musical experience mixed by Basilik to create a unique composition. Music, always… every July, the Abbaye aux Dames welcomes the Festival de Saintes, an event dedicated to classical music. That’s a date for our diaries! This fun, sensory adventure has awakened our taste buds. We head off towards the Charente River and the old town, where we’re given a friendly welcome by a broad array of excellent restaurants. Our exploring takes us past some beautiful residences from the 18th century. Some are now home to museums that contain must-see collections: paintings, sculptures and ceramics are all to be found in Saintes’ former town hall, the Echevinage Museum, while unusual, surprising objects linked to Saintonge, decorative arts and daily life are in the Dupuy-Mestreau Museum. Between the two, we admire the flamboyant doorway of Saint-Pierre Cathedral. 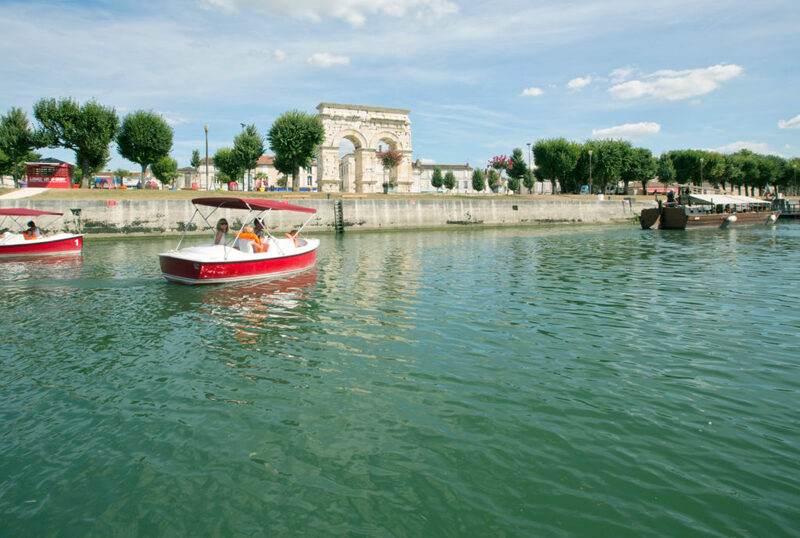 This sunny afternoon is perfect for a cruise on the River Charente. There are a variety of vessels setting sail in the centre of town, including barges, traditional flat-bottomed boats, electric boats and tourist river boats. We board the Bernard Palissy III for a zero-emissions trip on the river. The only one in Europe, this 24m solar-powered boat with space for between 8 and 10 bikes sails using 100% electric propulsion. You can even book night cruises for an incredibly magical and romantic ambiance. On the left bank, Saintes showcases two of its most beautiful icons. 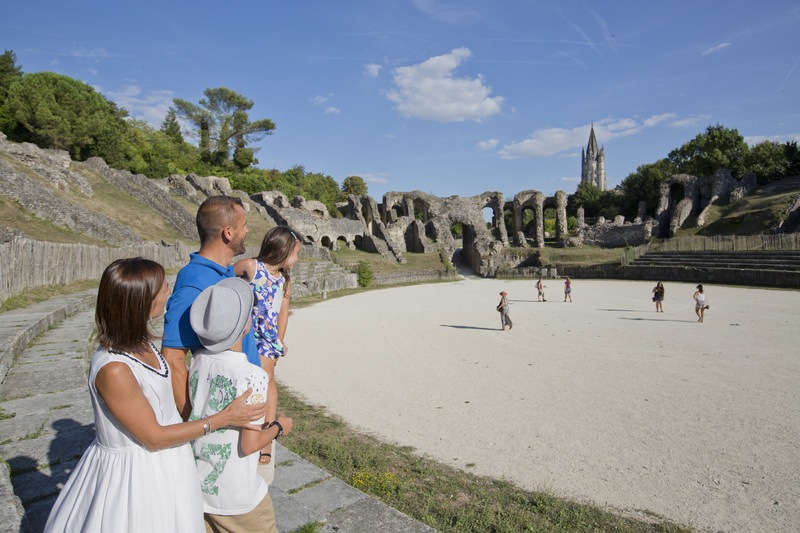 The Gallo-Roman amphitheatre transports us to the first century A.D., a time of battles between gladiators watched by baying crowds of up to 15,000 people. At 126m by 102m, its dimensions are impressive even today. An aqueduct, thermal baths, ramparts and many more historic vestiges, as well as the archaeological museum, all bring this fascinating era to life.
. There’s a bewitching atmosphere in the building’s crypt, and the two overlapping choirs are a unique feature. After lunch, we decide to treat ourselves to an excursion outside the town in Port d’Envaux for a unique adventure at Les Lapidiales. Each year in the old Chabossières quarry, sculptors from around the world come to carve into the white limestone walls. This evolving open-air collective work is something we would come back to with the kids. Although our trip was over, we’d already been inspired to return and explore all of Saintonge’s treasures.